Jib cranes appear in an extensive variety of configurations and perform many tasks in many contexts. Some of the most prominent and recognizable jib cranes are tower cranes. These cranes are used for the construction of skyscrapers and other very large structures. They feature a single, very tall support stand, on top of which a single jib arm is placed perpendicularly and off-center. A cab from which the tower is controlled is placed at or near the intersection of the jib arm and the tower support. On one end of the jib is the winch or hoist system, which is an extremely strong cable that is attached to loads and lifts them. On the other end of the jib arm is a balancing weight, which can often be several concrete slabs affixed to the arm. Tower cranes can rotate 360° assuming that there is nothing to block their path of movement. Other jib crane configurations include telescoping cranes, loading cranes and small dock mounted cranes. Jib crane configurations account for some of the largest and smallest industrial crane designs. Lifting cranes are necessary in commercial hauling as well as in aerospace manufacturing for the movement and placement of parts during the manufacture of very large vehicles. Jib cranes make possible the construction of tall skyscrapers as well as individual automotive components in factories. They can be operated by a mechanical winch, or they can be operated by hand through a combination of pulleys, counterweights and friction stopping mechanisms. They are usually made out of strong metal materials like steel. Whatever the context, every precaution must be taken to ensure the structural integrity of the crane, the reliability of the winch hardware and mechanisms and the general safety of the working area around the crane. Tower crane failure in particular is catastrophic, causing deaths and many thousands of dollars in damage, especially after failures in densely populated urban areas. 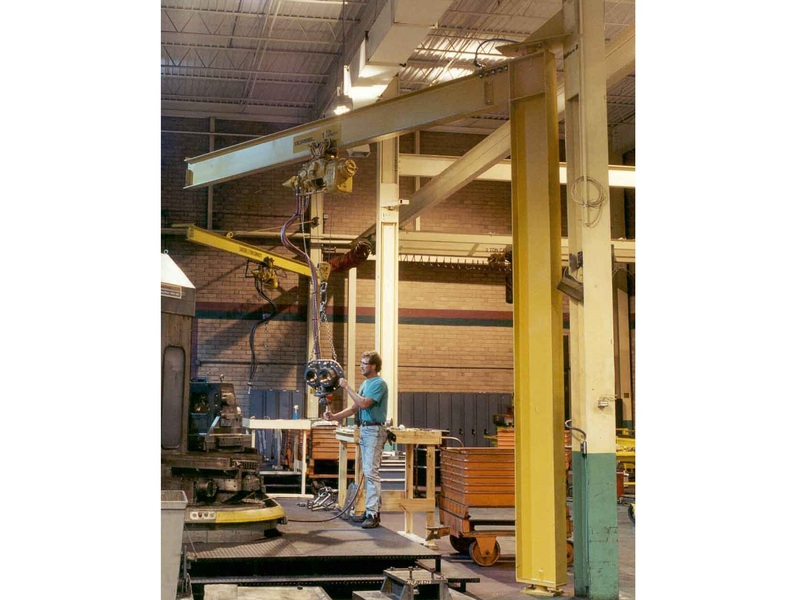 Even in smaller applications, jib crane failure can result in product loss and worker injury. Proper jib crane materials and careful application should be a top priority of operations that make use of jib cranes. Jib Cranes Jib cranes are materials movement tools that use a combination of a single mechanical arm and winch mechanism to lift and move objects. Any crane system that features only one primary loading arm is considered to be a jib crane; this is true even if support beams are built to strengthen the single jib arm and its support.